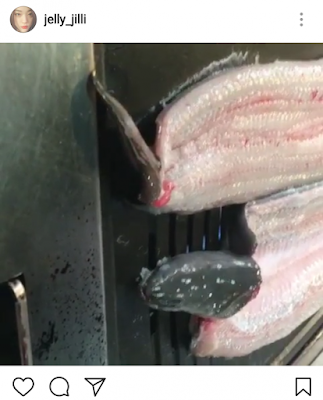 She cut open the eels before grilling it, in the video it was seen that the eels were suffering in pain to their deaths. Sulli was also heard laughing while dubbing the eels like "Help me~~ Help me~~ Aaargh~"
Fans were shocked to see this video, including the overseas fans as well. Some of her fans shielded her saying that it's not that different with people eating raw octopus. Her fans are currently fighting and arguing in the comment sections. She already deleted the post from her Instagram. -She slightly looks like a psychopath here..
-I think the troublesome part of the video is how she dubbed the eels.. People do eat raw octopus and cow, but they don't make fun of those animals when they see them dying.. And also the way she addressed the netizens with 'You guys (in an informal way)..
-'You guys are worse'??? Is she in her right minds..
-Why did I decide to watch that video.. I got goosebumps all over my body..
-I seriously don't understand why she's acting like that..
-At first, I thought she was just pretending to act strange and weird.. But now that I look at it, I don't think she's pretending..
-That's so disgusting and shocking..ㅠㅠㅠ Why did she upload such videos to Instagram..
-What's the meaning behind all of these? -Seriously though.. It's just like how you all eat raw octopus.. I don't see anything controversial from it..
-Sometime, I wonder what's going on inside her mind..
-Forget about the video, why is she addressing us in an informal way? -I don't think I can eat eels anymore.. -Hmm..I don't think this is a big problem, though..
-I wonder why she keeps on uploading controversial things to her Instagram.. I confessed to my crush and cried a lot today..